For some, the smell of a new carpet is an innocuous reminder of a recent home upgrade. For others, though, it’s an irritating stench that can make a room nearly unusable. However you feel about it, new carpet smell isn’t the healthiest thing you could be breathing, and it’s reasonable to want it out of your house as soon as possible. With the right approach, you should be able to get rid of the smell within a week or two, if not sooner. The odor of new carpeting is caused by chemicals known as volatile organic compounds or VOCs. This broad group of chemicals includes many that are frequently used in the manufacture of household products such as paint, vinyl flooring, and pressed-wood furniture. Volatile in this case means they evaporate at room temperature. As a new carpet gradually releases, or off-gasses chemical residue, the chemicals enter the air where we can smell them. Within a few days to a few weeks, these fumes dissipate, and the carpet no longer smells. The VOCs responsible for new carpet smell are 4-phenylcyclohexene (4-PCH) and, to a lesser extent, styrene. These usually come from the synthetic latex in the carpet’s backing, as well as from the padding and adhesives used to secure the carpet during installation. Dyes, water repellents, anti-static agents, and other chemical auxiliaries can also bring VOCs into your home if they weren’t completely rinsed out during manufacturing. Carpets have some of the lowest VOC emissions of any household material, and you can find low-VOC and even VOC-free carpets if you don’t want to deal with new carpet smell at all. The padding and adhesives have somewhat higher emissions, however, and because carpet often covers a large area, it’s usually one of the main sources of VOCs in the house. Even so, the amount of VOCs a new carpet releases won’t affect the average person’s health and there’s no known link between 4-PCH and any adverse health effects. You should be fine as long as you follow the carpet manufacturer’s guidelines, which usually recommend thoroughly ventilating the newly carpeted room for around three days, and not using the room for that time. In particularly sensitive people or those with health conditions such as asthma, VOCs can sometimes cause nausea, headaches, dizziness, and eye, nose and throat irritation. If you notice these symptoms or you just don’t like breathing in that chemical smell, it’s worth going to a little extra effort to clean up your air. The first step in limiting the VOCs a new carpet brings into your home is to choose a low-VOC or non-VOC carpet. Look for carpets that carry the Green Label and Green Label Plus labels from the Carpet and Rug Institute (CRI). These indicate a carpet produces very low emissions. Choosing carpet made from natural materials and dyes, such as wool in natural or plant-dyed colors, also helps. Ask your installer about using a non-adhesive installation method, such as a floating installation. If that isn’t possible, ask them to use low-VOC adhesives. Before the carpet is installed, unroll it in a dry, well ventilated area for a few days first. If possible, tack it down to keep it flattened. This lets the carpet off-gas most of its chemical fumes outside your home. If your new carpet is part of a larger renovation job, wait as long as you can to have the carpet put in. This way your carpet won’t absorb VOCs from other materials and substances, such as paint. Once the carpet is installed, ventilate the room as much as you can until you no longer smell an odor or for at least 72 hours. Open the windows and put fans in the room turned up to their highest settings. Keep the door to the room closed. After this, just giving your carpet a good vacuuming might be enough to get rid of any odor still hanging around. If it isn’t, sprinkle baking soda on the carpet, let it sit for 24 hours, then vacuum again. The baking soda will absorb a certain amount of the off-gassing chemical fumes. For a really stubborn odor, steam cleaning can help by rinsing away any chemical residue that might be left in the carpet fibers. Using a basic steam cleaner rented from a home improvement store is a good start, but having a professional carpet cleaning will be even more effective. To get rid of new carpet smell lingering in the air, try a portable air purifier with an activated carbon filter, which can trap gaseous air contaminants. You can also find activated-carbon filters designed for your air conditioning system. With one of these installed, you can run your A/C to ventilate your newly carpeted room even faster. Standard fiber media air filters, HEPA filters, and electronic air cleaners don’t work against airborne VOCs, so choose your air purifier carefully. 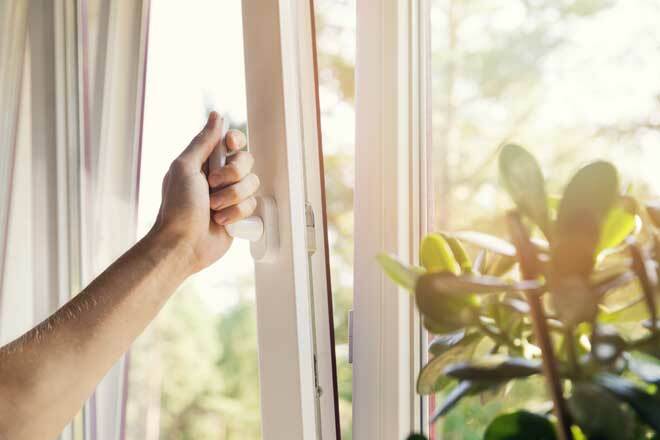 Some plants, including Boston fern, spider plant, bamboo palm, and English ivy, can break down certain VOCs in the air, so they’re a healthy addition to your living space and might reduce odors seeping out from your newly carpeted room. 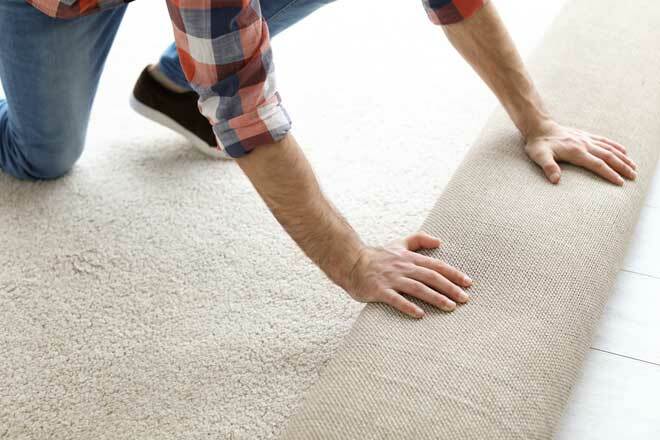 If your new carpet is giving off a smell, chances are you have nothing to worry about. The small amount of chemicals in that odor is unlikely to make you ill, and the odor should be gone within a week or two as long as you properly ventilate the room. If that new carpet smell is making you unwell or it’s just too unpleasant to be around, vacuuming, steam cleaning, and using an activated-carbon air purifier can help you get your air cleaner faster.